2412, Jalan E3/6, Taman Ehsan, Kepong, 52100 Kuala Lumpur, Malaysia. 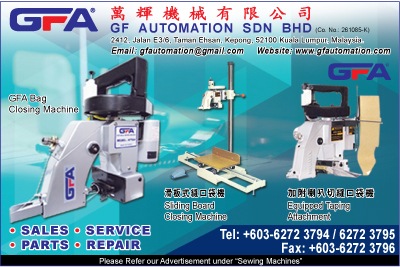 Establishment since 1991, GF Automation Sdn. Bhd. specializes in manufacturing and distributing sewing machines. Having a mix of locally designed and international designed machines, GF Automation distributes to approx 80% of the Malaysian market share. The main targets are the garment mattress and sofa industry. We have also expanded our export market to the neighboring countries. 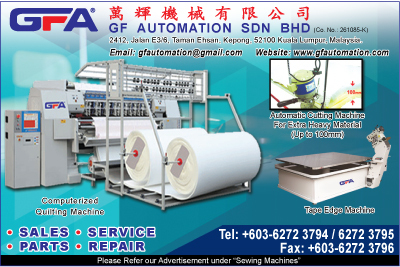 Besides, selling all kinds of sewing parts, GF Automation provides prompt after sales services. GF Automation has an added advantage in the market. By having a variety of model products to offer, high quality and prompt after sales services, stock availability and a wide range of other services.